2011 and 2012 saw major software vendors rushing to offer digital marketeers a one-stop solution for creating, publishing, analysing, managing content and measuring the performance of their social media properties. Many acquisitions have been involved. 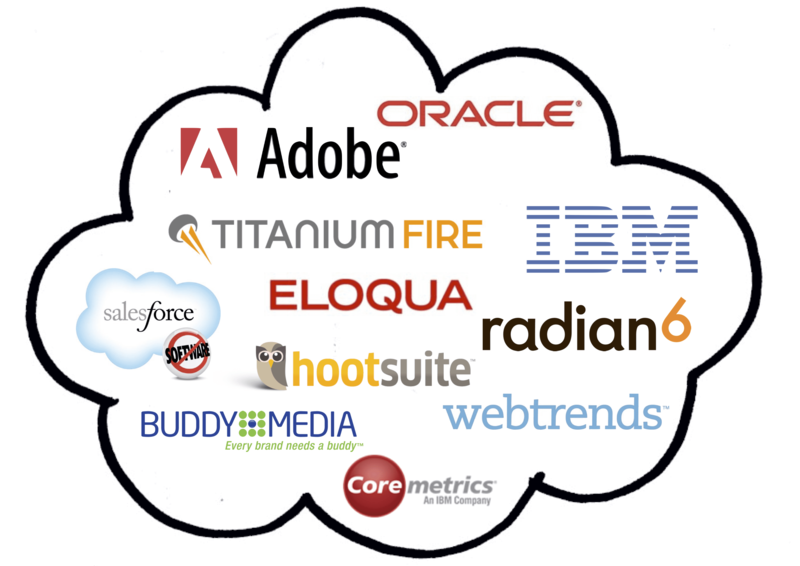 To name but a few, Salesforce.com bought Buddy Media after acquiring Radian6. Adobe has also been busy inflating their marketing cloud, as has Oracle with their recent December $871 million acquisition of Eloqua . You can see the aim of these acquisitions as the major vendors seek to provide a single marketing service covering customer acquisition, conversion and retention marketing activities. Here are two examples from the largest vendors. 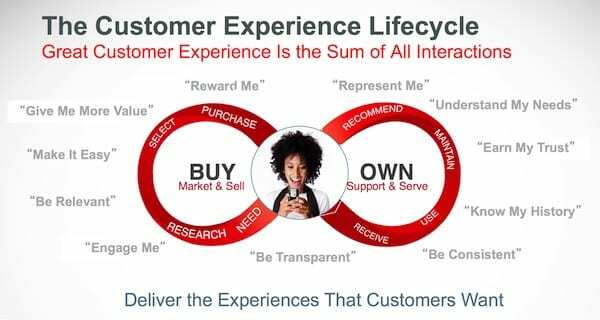 In a presentation accompanying the announcement Oracle explain their new offering the benefit of a unified customer experience across all customer touchpoints/interactions. Analytics vendors have also been involved in merger and acquisition. IBM purchased Coremetrics, HootSuite integrated with Webtrends analytics and a Social Media Command Centre. Many other niche vendors have also emerged. It’s no wonder the big guns are getting in on the act given that analysts such as Gartner are predicting that CMOs will be responsible for more expenditure on IT than CIOs in the next five years. Well, there is no one definition and the term itself is a misnomer. The core feature of a cloud-based service is simply that marketing data is stored on servers external to a company and accessed by users over the Internet via a web-browser interface. Of course cloud software services are well established, but what if the cloud are marketing systems themselves? Perhaps the best way to understand cloud services is to look at some of the most common examples of cloud services we use in marketing. The label ‘Marketing Cloud’ suggests a range of integrated systems that handle all things marketing. Well that may be the end game of the cloud system providers, but they are not there yet. It’s a cloud too high given all the different tools digital marketeers use. Tools spanning website design, SEO, SEM, attribution measurement, insight analysis, data mining, big data, CRM, SFA, eCommerce, collaboration, content creation and dynamic publication, social media management, email automation and so on. Tools to help automate the process creating, publishing and managing social media content across multiple social network platforms. Systems to automate the process of publishing and monitoring the performance of social media campaigns and display ads (if you want to waste your money on social media display ads). Tools to monitor, analyse and report on market/consumer sentiment, engagement, reach and influence. 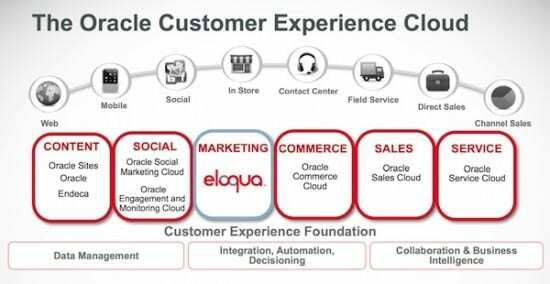 Some vendors such as Oracle are including in their Marketing Cloud systems that have evolved from mail and website lead nurturing (known as Marketing Automation). 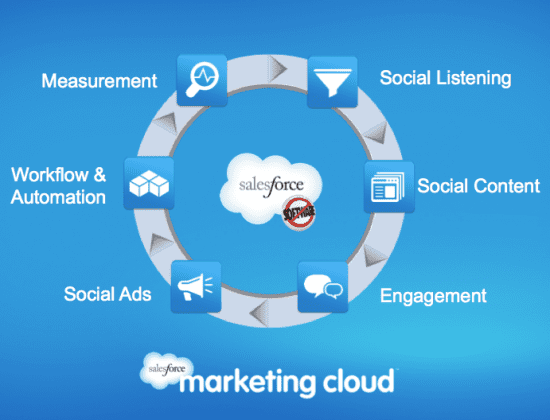 Why do you need a Marketing Cloud? The initiated will have discovered the power of social media. However they will also have found out that harnessing this power is very resource intensive and demands a deep understanding of integrated digital marketing. Yep, social media requires highly experienced digital marketeers who have done a deep dive into social media. I think that most brands have learn't the painful realities of recruiting ‘Twitinterns’ to be the vocal voice-piece of their organisation or expecting their marketing agencies to have a full grasp of all the many facets of social media. Given that social media needs specialists and dedicated resources, any new methods to help manage social media operations, reduce overheads whilst performing highly effective strategies are going to be welcomed - enter the Marketing Cloud. But be warned! Many of these technologies are powerful and require an initial investment of time and again, resources, to get any value from them. Hopefully, all driven by a great social media strategy that is fully aligned to and integrated with the overall marketing, communications, customer services, CRM, goals and strategies. Social media operations should never be conducted in isolation. It's real power will come when the technologies enables marketeers, Customer Services Directors, Insight Directors and the like, to automatically correlate unstructured social data with transactional data. I am sure I don’t have to explain why! Therefore, pick a Cloud provider who can, or is definitely planning to seamlessly integrate their Marketing Cloud systems with the Sales Cloud, Service Cloud, Lead Nurturing and online community building systems. Otherwise you could be heading down a blind alley. For further tips, check out my previous blog post at Titanium Fire ‘Navigating the world of social media monitoring tools’.